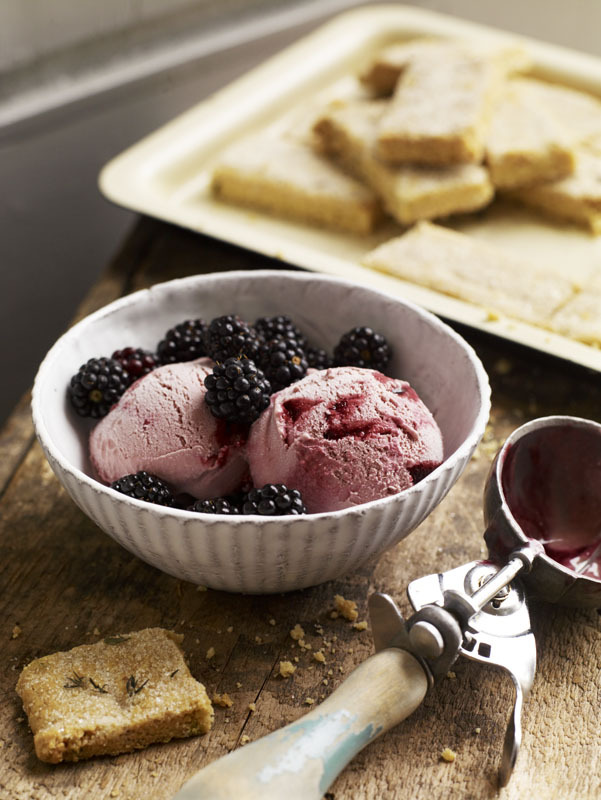 Blackberries are a big thing in my kitchen: a big seasonal deal. Wild and free, sweet and deep flavoured, they’re a stimulus for the senses and the memories. When blackberries are about we try to pick as many as we can, for jam and jellies, for venison and duck, and – as in recipe – with apples for ice cream. Peel, core and slice the Bramley apples. Place them in a pan with 500g of blackberries, 100g of sugar and 100ml of water. Cook the fruit gently until the apple breaks down and the blackberries are tender and bursting. This will take 10-12 mins. Now remove the fruit from the heat and either puree with a stick blender or place in the jug of a blender and pulse until smooth. Put the milk and cream in a saucepan, bring to a simmer, then remove from the heat. Beat the egg yolks with 150g of sugar until well combined. Pour the hot milk and cream over the egg yolk mixture, whisking all the time. Return the custard to a clean pan and cook gently, stirring all the while, until it starts to thicken enough to coat the back of a spoon. Don’t let it boil or it will split. Let the custard cool. Combine the fruit puree with the custard and then pour the whole lot through a sieve in order to remove the blackberry pips. Chill the mixture in the fridge. To make the blackberry coulis, place the remaining 250g of blackberries in a pan with the last of the sugar and 50ml of water. Cook gently until the fruit is soft and breaking down. Pass this through a sieve to remove the pips. Churn the custard in the bowl of an ice cream machine until soft set. Remove the ice cream from the machine and place in a suitable container. Before you put the lid on, swirl the blackberry coulis through it.